Cobram, a rural township in northern Victoria, is on the Murray River, north of Shepparton. It is situated in the Murray Goulburn irrigation district. Cobram was the name of a pastoral station taken up by Octavius Phillpotts in 1845. It is thought that the name is derived from an Aboriginal word meaning head, and that Cobram was the head pastoral station in the district. In the 1870s the era of pastoral occupation began to pass as smaller settlers took up farms, beginning with wheat and diversifying into orchards with local irrigation activity. In 1879 a school was opened at Cobram East, about 8 km away from Cobram, and nine years later a school was opened in Cobram itself. By then the original Cobram township survey was on the verge of development as the Cobram Railway League anticipated the extension of the railway line from Numurkah. Township sites were sold in 1887 and the railway terminus at Cobram was built in 1888. In 1889 a punt service across the Murray River was opened, connecting New South Wales to the Cobram railway terminus. By the mid-1890s Cobram was described as a rising township with two hotels, three stores, two implement factories, a newspaper, a sawmill, a school, a mechanics' institute and Methodist (1889) and Presbyterian (1894) churches. During the 1890s Depression unemployed workers built levee banks along the edge of the Murray River forest reserve to reduce flooding. It took longer to construct water storages to fight fires which periodically burnt down buildings in the town centre; water towers were finally constructed in 1925. Cobram's development has principally depended on the growth of farm irrigation. Private pumping plants brought river water to citrus orchards on the higher sandy loams, but the critical growth period was in the post-World War II years, when the benefits of the Hume and Yarrawonga weirs (1930s) could be realised. Returned service personnel settlers were allotted irrigated holdings for fruit orchards and dairy farms in an area between Cobram and Nathalia to the west. Included in the closer settlement activity were European (mainly Italian) migrants, continuing a pattern of migration which had begun in the 1920s with Italian market gardeners. 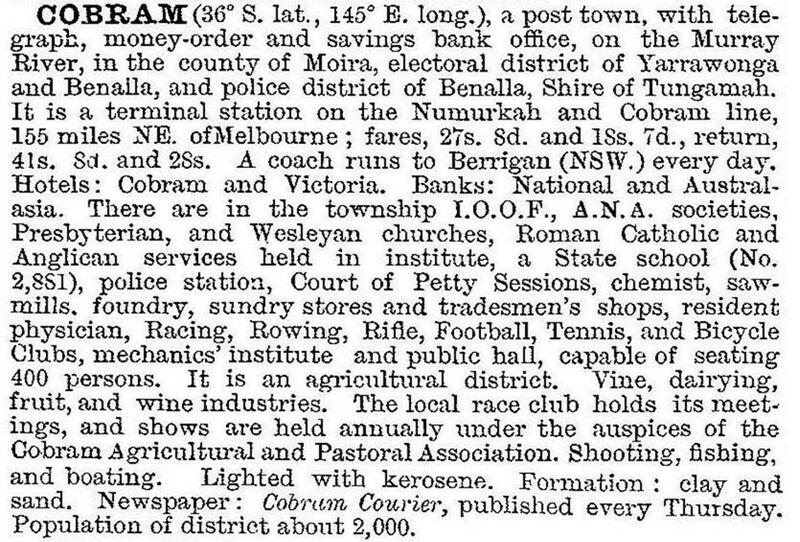 In 1949 a town plan for Cobram was adopted, anticipating a period of industrial and urban growth. On 18 May of that year the Murray Valley Soldier Settlers' League resolved to establish a dairy goods factory in Cobram, and the Murray Goulburn Co-operative company was formed. By the 1970s the Co-operative was one of the largest dairy companies in the southern hemisphere, operating in the Southern Riverina (New South Wales) as well as Victoria. The tripling of Cobram's population in the 20 years after the war was accompanied by the opening of a consolidated school (1952), a high school (1962), creation of a Cobram Shire separate from Tungamah Shire (1953), a caravan park (1962) and a motel (1964) as tourism figured more in the town's economy. In 1995 the shire had 235 bed spaces and 1039 camping spaces. The Cobram Peaches 'N Cream Festival began in 1973 and Cobram's growth was assisted by an active Cobram and District Development League. The shire had a moderately high area of retail floor space – 15,000 sq metres (1985) – larger than Tungamah Shire (700 sq metres) but smaller than Shepparton city (100,000 sq metres). Railway passenger travel to Cobram ended in 1993, and the line fell into disuse in 1999. Cobram has State primary and secondary schools, a Catholic primary school (1922), an Anglican P-12 college (2000), four churches, motels, hotels and caravan parks, a hospital (1949), saleyards, showgrounds, extensive indoor and outdoor sports facilities, beaches on the Murray River, a cooperative cheese and butter factory and a regional headquarters of Goulburn-Murray Water. There are orchards (mainly peach, pear and apple) on three sides of the town, and the Murray River and a linear State forest on the north-east side. Some orchardists have diversified into vegetable growing. Most fruit is processed by Shepparton canneries. The Murray Goulburn dairy processor began marketing its Devondale brand to Asia in 2014. Farmers in Cobram received licenses in 2014 to begin growing poppies. The state government's Department of Primary Industry office in Cobram, that provided support and advice to the region’s farmers, closed in 2012. Cobram Shire, which was created on 1 April 1953, had an area of 322 sq km. It had previously been the north-west riding of Tungamah Shire and included the districts/towns of Katamatite, Koonoomoo and Yarroweyah. The shire's intensive horticultural areas in 1994 comprised 2139 ha for fruit orchards and 206 ha for vegetables. Wheat was grown on only 606 ha. Livestock comprised 22,000 dairy cattle, 20,500 sheep and lambs and 5500 pigs. On 18 November 1994, Cobram Shire was united with Nathalia, Numurkah and most of Tungamah and Yarrawonga Shires to form Moira Shire. At the 2011 census, dairy product making accounted for 12.2% of Cobram's employment and orcharding 6.3%.